Brain growth is limited by the availability of critical nutrients, not just kJ. Omega 3 and iodine are critical. See Steve Cunnane’s paper at http://users.ugent.be/~mvaneech/Cunnane.html from the Ghent symposium http://users.ugent.be/~mvaneech/Symposium.html ( a symposium which mainly focuses on the aquatic ape hypothesis). The Real Origins of Diseases- Mainly Nutritional? The germ theory of disease is medicine’s main success area. It lead to immunisation and antibiotics. Besides infections, which diseases do we know the true origin of? Infective, traumatic, toxic and a handful of the population have significant genetic disorders. These are the only ones we can prevent and we have good methods of treating. We can also treat deficiencies and surgeons can treat regional complaints (eg kidney stones, appendicitis, gallstones- but as we do not know the cause we can’t prevent them). This is the true irrationality of health- medicine is in such a primitive state that it only knows the origin of about 15% of disease! If that. We don’t know the true origin of cancer, arthritis, asthma, gallstones, kidney stones, appendicitis, diabetes type 1, autism. Much money is used looking for genetic origins, yet it is unlikely they will be found. Actually I think they are all primarily nutritional in origin- that’s why I’m interested in nutrition! I’ll throw in my 2 cents and lay a huge portion of the blame on the school system. The school system (generally) rewards inactivity and provides no reward for activity. There is a solution. Consider that selective school exams at end of year 4 and 6 are purely academic. In general, no consideration or acknowledgement for sport, dance, music, drama, or any other activity. Similarly for year 12 HSC (NSW at least). The students who haven’t dropped sport generally do so in year 11 or 12. They see it as a threat to their HSC performance and TER and might miss out on their course or university of choice. (Of course for elite athletes there are TER bonuses etc, but I’m looking at the kids in the middle). At the end of the HSC the top TER’s have a lot of kids who have sacrificed a lot, including their fitness to get there. Many have been in coaching colleges from year 4 all the way through. It leaves little time for sport dance music or any other activity. I worry that some of the kids outside our local coaching college look a bit stressed if not traumatised. No wonder some of them seem to have great marks and no communication skills. There are attempts to address this by other tests like the UMAT but it does not address the problem that sport has been dumped. In NSW at least dropping sport for the HSC is thus almost inevitable. I view the HSC as being like an old car that has had too many accidents, too many repairs. An alternative curriculum like the International Baccalaureate http://en.wikipedia.org/wiki/IB_Diploma_Programme which is a designed system, is a much better alternative. Sport is compulsory, as is some community service, a language, theory of knowledge and recognition of culture etc. Overall it seems a very superior system. And certainly will produce a fitter healthier student, and hopefully one with a more rounded education. Dare I say a Renaissance person. The IB is available for senior school, middle school and junior school. Some countries have adopted the IB for all levels of all their schools. It is growing rapidly. Queensland and Victoria have apparently looked at moving their government schools to IB. I think that education is a nation’s greatest investment. Much of Australia’s current ongoing boom can be traced to the brain explosion of free then affordable universities introduced in 1972 by Whitlam. This got the best people into the hardest courses and we all benefit, even if it has gone of the rails a bit. I hope the 2020 conference looks firmly at providing the best education system for the nation’s future, and one in which sport and recreation has a firm role. We need to jump away from the common mind set that confuses PHENOTYPE with GENOTYPE. 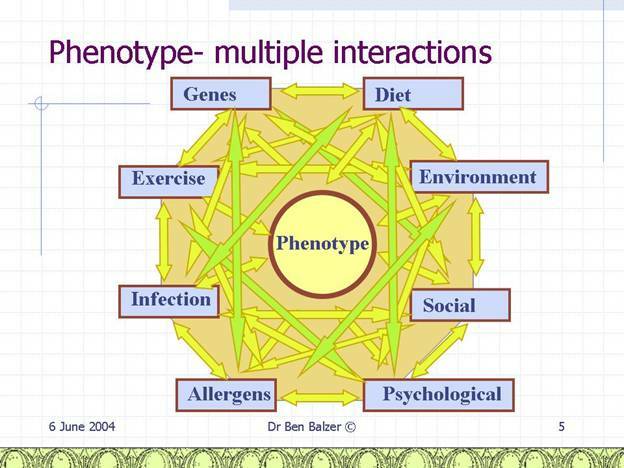 Phenotype is what “we get” and what actually matters. The phenotype is the “final product” that we get to see, whether it be height, weight, strength, blood pressure, cholesterol, heart disease, cancer, depression or any other feature of the organism. Genotype is the architect’s plans which usually have some differences from the building itself. The phenotype is like the final building, the genotype like the architect’s plans, the diet like the building materials and exercise like the workmanship. Anyone who has built or renovated a house knows that mistakes in the plans (genes) are fairly uncommon compared to cheap substitute materials (poor diet) and poor workmanship (lack of exercise). We have a few genetic diseases, then a lot of gene nutrient/diet interaction diseases, then a great mass of straight out dietary diseases. I say this because as a doctor, I think most doctors behaviour indicates that they confuse phenotype with genotype. This mindset causes a fatalism that thinks that no treatment is worthwhile other than a drug. Personally I think that variations in diet and exercise have a greater influence on variations in phenotype than do variations in genotype. Which is why I am interested in nutrition- if the previous sentence were not true, then there would be no point in studying nutrition or exercise. There would be no point in the 18,000 diet books on Amazon. But I think people’s instincts are correct, that diet does have a profound influence on health. And we can change our diet but not our genes. And we have to eat, so why not improve our health as we do it? Even though the sentence in bold is somewhat philosophical, I hope it is not too confusing. Jerome Groopman wrote a nice book “How Doctors Think” or don’t think, or have a herd mentality like everyone else might be better titles. How we model health is profoundly important, the better our model, the better we perform. Imagine treating pneumonia before we knew about bacteria- this is a good illustration of how the correct model transforms everything. This is Simopoulos’ Hippocratic model http://www.fao.org/docrep/W5849T/w5849t08.jpg This expands the bio-psycho-social model to add spiritual. I use a slightly more detailed model… You can pop in sunlight, gravity and any other attribute you wish under environmental or social. Spiritual should be a separate category but I didn’t put it in then. I’d probably also add education, government and a couple of others, Any suggestions? You are currently browsing the Ben Balzer's Paleolithic Diet Site blog archives for April, 2008.